Chamomile marks many people’s first venture into herbalism, and it’s usually because they have problems sleeping. The value of the plant as a mild relaxant has made it a popular choice in prepared teas found in nearly every grocery store. But chamomile benefits don’t stop there—this flowering jewel is able to provide an array of health perks. What’s more, growing chamomile at home is quite an easy task. There are several varieties of chamomile, all members of the Asteraceae family. Most popular in herb gardens and commercially prepared teas, however, is German chamomile (Matricaria recutita), also sometimes called Hungarian chamomile, wild chamomile, or scented mayweed. This plant is an annual (dies off in the cold season) and grows in small bushes to be about 20 to 30 inches high. It has smooth stems with long, narrow leaves, and little white flowers that used in herbal preparations. These small flowers resemble small daisies, with yellow centers and a strong, pleasant scent. The first recorded use of chamomile occurred in Ancient Egypt. The plant was held in high reverence for its ability to cure ‘Ague’, what is very much like an acute fever. Because an acute fever can be relatively common, extremely uncomfortable, and usually just goes away with time, a cure for the illness probably made chamomile quite popular. 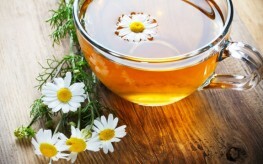 The word chamomile comes from the Greek Chamomaela, which translates to “ground apple”. In Spain, it is still called the “Little Apple”. These titles likely come from its scent. Over the years, the herb has been used for flavorings, incense, beverages, and for treating a variety of health ailments. Perhaps the most widely known use of chamomile is in its benefits as a mild relaxant or sedative. It has been used in this manner for centuries and can be found in grocery store aisles under names like “Sleepy Time Tea” for precisely this reason. Taken 30 to 45 minutes before bed, chamomile can help you relax and prepare for a restful slumber. But despite its popularity as a soothing relaxant, chamomile benefits don’t end there. Much of Chamomile’s ability to heal is due to phenolics within the plant. Phenolics represent a large family of compounds including flavonoids, quinones, phenolic acids, and other antioxidant compounds; they provide a range of health benefits, including protection against stress and healing cells. But what else is Chamomile good for? Researchers with the American Chemical Society found that chamomile’s phenolics have antibacterial activity, suggesting it could be useful in boosting the immune system and fighting illnesses like the common cold. In addition, study subjects who drank the tea on a regular basis had elevated levels of glycine, a protein known for relieving muscle spasms, which could explain it’s relaxing qualities. Chamomile has also been shown to have antimicrobial, antioxidant, antiplatelet, anti-inflammatory, antispasmodic and antimutagenic properties, according to researchers with the USDA Human Nutrition Research Center. While science is slowly unlocking all of Chamomile’s benefits in the lab, there is no question that individuals throughout history have experienced the benefits even without the science to back it up. Even better news? You can easily grow your own chamomile to experience chamomile benefits. Like growing oregano or growing parsley, growing chamomile is fairly easy with some basic tips. Because there are several varieties of the herb we know as chamomile, these tips are specifically geared towards growing the variety known as German chamomile. The plant is best grown from seed, rather than potted as an already partially grown plant. Seeds can be started indoors and moved outside after fear of the last frost has passed. Otherwise you can direct sow in the soil in late spring. Chamomile seeds need sunlight to germinate. This means you don’t want to completely bury them in the dirt or plant them in a heavily shaded area. Instead, scatter the seeds and lightly mix with the top soil. As for water, the plant doesn’t need to be overwatered, but it shouldn’t be completely dry between soakings either. When the flowers on your chamomile plant begin opening up, harvest them. The more you harvest, the more that will grow. You should be harvesting every few days. Cut the stem just above a lead node, or where a leaf joins the stem, then remove the flower and place in a basket or on a drying rack. Move the flowers around from time to time to ensure they are drying completely. Once they are thoroughly dried, you can store the flowers in a glass jar in your cabinet. They will keep for several months as long as they are kept dry and out of the sun. If you want to use chamomile topically– on rashes, cuts and other skin ailments, for instance—you can create a compress by simply making a more concentrated “tea”. Once the tea has cooled, dip a cloth in it, wring it out and apply to the affected area. You can similarly use this tea as a facial or hair rinse. From your skin to your stomach or even a stressed mind, chamomile is a master-soother, and one you can easily add to your healing herb garden. Experience chamomile benefits today, and share your thoughts with others! This is good information. However, the risks of consuming chamomile in large quantities should have been noted also. There are side effects. It is not a harmless flower. I wish you submitted a URL linking to what side effects you were referring to.